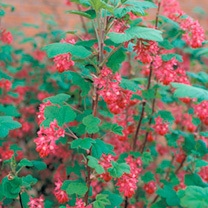 Ribes King Edward VII is an easy to grow, upright shrub perfect for almost any position in the garden. One of the most popular varieties of ornamental currants, the scented dark red flowers that cascade down the plant in spring give way to small dark edible beries in summer. To provide extra interest later in the year, the leaves to shades of pink and red in autumn. Supplied in a 5-7.5 litre pot. Ribes King Edward VII is an easy to grow, upright shrub perfect for almost any position in the garden. One of the most popular varieties of ornamental currants, the scented dark red flowers that cascade down the plant in spring give way to small dark edible beries in summer. To provide extra interest later in the year, the leaves to shades of pink and red in autumn. Supplied in a 4 litre pot or 5-7.5 litre pot.